Join the discussion on our forums! Come discuss Grimy Gadgeteer over in our dedicated Grimy Gadgeteer discussion topic. At the end of your turn, give a random minion in your hand +2/+2. 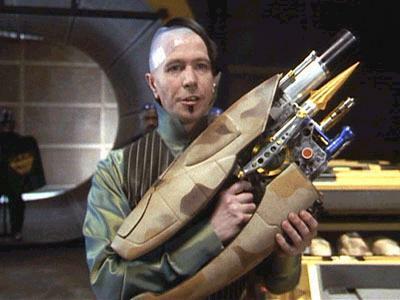 "You look like a Gadgetgun 3000-Mark IV man, am I right?" I think the problem with this card when the set was first released wasn't with its power level - it was the meta. There were a lot of staple minions in the MSoG meta that didn't care at all about buffs: Ragnaros the Firelord and Sylvanas Windrunner among them, not to mention Varian Wrynn if you aren't running a control or Pirate deck. This is all coming from a guy that fiddled with a Grimy Goons Warrior deck a lot back in MSoG. Is it just me, or is Ragnaros a magnet for this guts buff? 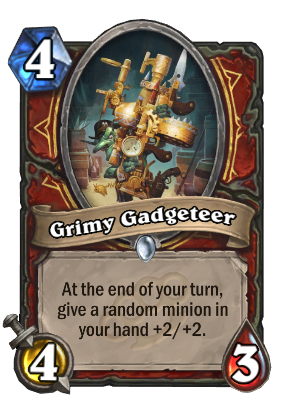 Not many Grimy Goons for warrior, but the one card he got is amazing. I hate those 4/3 cards. At least give them 4/4 or 3/5. So I learned something interesting the other day: when/if this card (or any other Goons card) ever buffs your C'Thun, the game doesn't display that little pop-up that tells you and your opponent how big your C'Thun is. Not only does this mean you can surprise your opponent with how big your C'Thun actually is, turns out you can trigger cards like Ancient Shieldbearer despite not having buffed your C'Thun using the normal buff cards. I still barely know what I'm looking at here. I think they want this to be used in Taunt Warrior; it may just live more than one turn if you hide it behind a Taunt, and by pairing it up with Stolen Goods and maybe that Brass Knuckles card, you might just be able to stall until you've created a handful of supermassive Taunts that your opponent may simply not be able to push through in the mid-to-late game. Even buffing an Armorsmith, Acolyte of Pain, or Ravaging Ghoul could be hugely useful. Just pack your deck with early/mid-game cards and rely on all these new hand-buffing cards to turn them into late game threats. I dunno, almost sounds viable. Dopplegangster is the new Dr.5 confirmed. Not bad arena card. Ok stats, good value. Hearthpwn should have option preety good or good just for example this card is not meta defining but i better than playable preety good is right call in this one i think. Well, a must kill card that is a 6/5 split on 2 bodys. That is really strong for 4 mana. So the downside is, if you topdeck it, it does nothing. So basically, the potential is insane, the downside is negligeable. Seems really good. It seems indeed. I can definitely see this one having a huge impact in Arena. But in Constructed I'm having a hard time trying to see where this card could fit in Warrior current archetypes decks, besides how good it is. It's not for Control. It's not for Pirate I think. Could be somehow useful in Dragon Warrior, as that deck has 5 charge minions, but I don't know what you could cut really. Maybe if Tempo Warrior comes back this could be a card for that deck?